Application forms can be created and shared with external users, or applicants, who can then submit complete applications with file attachments. Applicants can also create a login ID, allowing them to return to the application and save drafts prior to submitting the application. From Workspace Settings, choose the Application Forms plugin. If this is your first time setting up an application form, then you will need to authorize the portal. Please review the guidelines here prior to authorizing. Click the green button " Create Application"
The configuration for an application form is divided into two parts: settings and application form pages. Create a URL, from which the application form will be accessed. Use lowercase letters, numbers, dashes, or underscores. See Publishing and Sharing an Application Form for more details. Access refers to whether or not your applicants can view and login to the application form. You may wish to have the application available to the public for a specific time period, or you may wish to have it available for internal use only during a testing period. If this is unchecked, then your applicants will not be permitted to sign up or log in to the application form. They will see a general "closed" message if they go to the application form URL. The Access tab also requires you to configure wherein Zengine the applicant login data will be stored, along with custom text for the login page. Applicant Data Form Choose the form in Zengine that receives the applicants data. It must contain a field with email validation. Applicant Email Field Choose the field within the Applicant Data Form that receives the applicant's email. Login Text Customize text that the applicants can read prior to signing up or logging in. We recommend introducing the program, as well as highlighting deadlines or special instructions. Logo You may choose to upload a logo that will brand the application form. We recommend this if you will be sharing the URL directly with your applicants. Do not choose this option if you will be embedding the form in your website. Custom CSS You may choose to add custom CSS to further style your application form to match your website's branding. Learn more here. Click on the Application Form Page to configure it. Choose the primary application form. 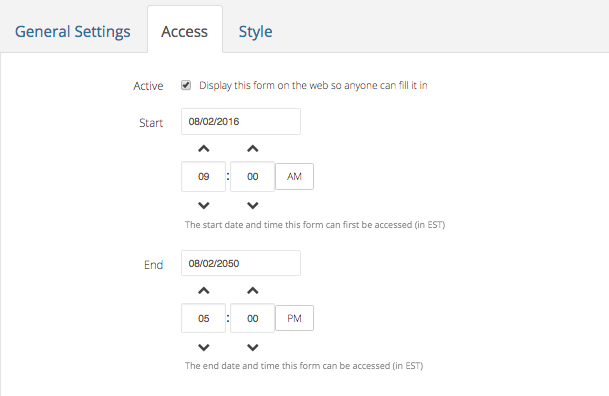 Note: You will need to primarily configure this form using the Zengine Form Builder. It must contain a linked field to the Applicants form that was configured above on the Access tab. Click on " Edit the Application Section" to further configure the application form. You may choose a submission folder and draft folder. These will override the default submission folder configured in the Zengine form builder. More about Organizing with Folders. Order: Choose default order or custom order. Then drag and drop fields to reorder. Show/hide field: Show all is the default option, but you can also override this with the Custom Show option. Note: required fields must always show. Warning: if an administrator subsequently marks a hidden field as required, then the application form will present errors. You will need to return to the application form to mark that field as showing, then save the portal. Labels: You may choose to override the labels. This is particularly useful for application forms in foreign languages. Overrides will be clearly highlighted in yellow. You may choose to reset it at any time. Help Text: You may also choose to override the help text. 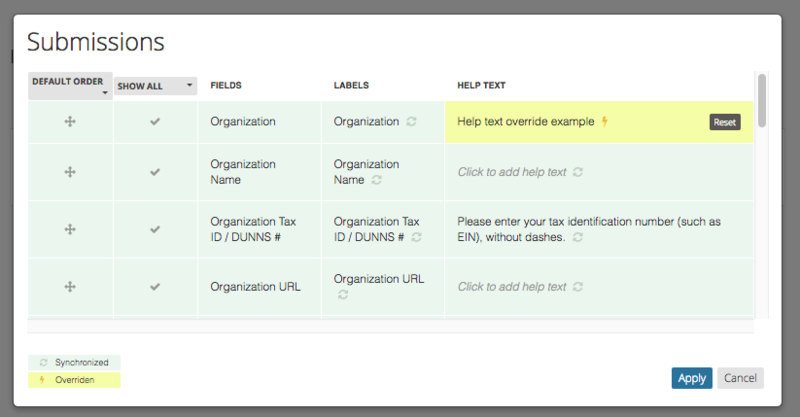 If adding a linked form field type to display to portal users, when added, these fields will be hidden by default. You will have to use this tab to show them if that is the desired result. After a user submits a form, you can display a confirmation message letting them know the form was successfully submitted and providing any other important details. To test your application form, click on the " Test Application Form" button on the top right. This will open the application form in a new window. Sign up as a new applicant. Fill out the form and either save as a draft or submit. Then go to the respective form on the Data tab to view the newly created record. Sharing the link to the application form is the simplest way to share the application form with external users. Click on the " Copy Application Form URL" button, the second next to the URL. Then share that link via email, by posting it on your website, or via social media. Often, it makes sense to embed the application form on your website, instead of sharing the link directly with your users. Click on the " Copy iframe code" button, the third next to the URL. Then place that code in the HTML of your website.